Here are some facts about Castle Stalker. Castle Stalker is located on a tidal island on Loch Laich, north-east of Port Appin, Argyll, Scotland. The castle is a keep with 4 floors. The islet upon which the castle sits is known as the Rock of the Cormorants. The castle can only be reached by boat. 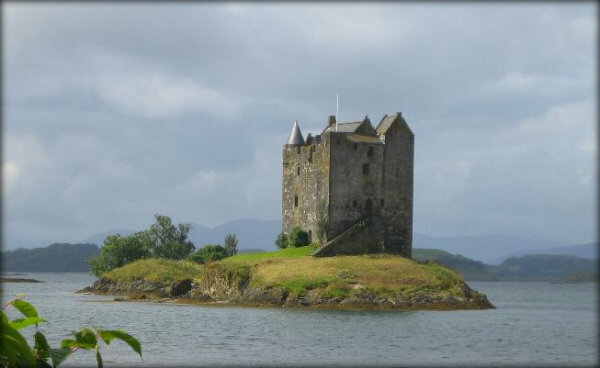 In the 14th century a small fort stood where Castle Stalker stands today. It was built by Clan MacDougall. In the mid-15th centurty, the Stewarts constructed the castle as it looks today. During the Jacobite Rising in 1745 Castle Stalker was used as a troop garrison. The castle was abandoned in around 1840, ownership having passed backwards and forwards between the Stewart clan and the Campbell clan. In 1908 basic reconstruction work was carried out by Charles Stewart. In 1965 Lt. Col. D.R. Stewart Allward fully restored the building. Castle Stalker has appeared in several films, including, Monty Python and the Holy Grail and Highlander: Endgame. James IV of Scotland often visited Castle Stalker when he was on hunting trips to Argyll. In Gaelic, Stalker means ‘hunter’ or ‘falconer’. The castle is currently privately owned. The public can tour the building between the months of March and October. Check out the official website. What next? Discover more castle facts by visiting our castle resources page.